Set includes both the CD and accompanying Coloring book. Be Children of the Church! 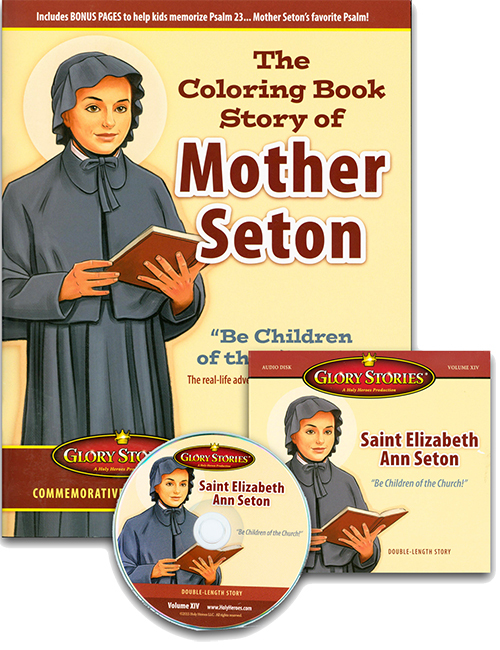 - The story of Saint Elizabeth Ann Seton, the first American saint, will inspire your children with the joy of following "The Good Shepherd." You'll learn to appreciate her favorite Psalm in a whole new way! She was a daughter--who converted her father to Christ. She was a wife--who converted her husband to Christ. She was a mother--who was convinced that the fullness of Truth was in the Catholic Church, so she and her 5 children became Catholic. She was a Mother Superior of a new order -- driven out of New York by anti-Catholic prejudice, in Maryland she started a girls' school and a religious order, the Sisters of Charity of St Joseph, the first American religious congregation for women. Buy the entire Glory Stories: 14 Volume Set and save $20.00!